Dash and Lily’s Book of Dares [Book Review] – my books. my life. “I was attempting to write the story of my life. Dash and Lily are both 16 and parentless this Christmas. Dash, by choice; Lily, by coercion. Dash finds Lily’s red notebook in the JD Salinger section of The Strand. This notebook takes them on a 10-day adventure throughout New York City as they pass it back and forth. They’ve never met but they pour their thoughts and worries out in this notebook. As the story progresses we learn more about Dash and Lily as they learn more about each other and themselves. Oh how I enjoyed spending time with Dash and Lily on their Christmas adventure. I was smitten from the beginning. Lily, with her overprotective family and her odd personality that has made her a bit of a loner. Dash, with his love of words and quiet anger at his parents. I loved watching them grow and as the book went on. Seeing the NYC sights vicariously through Dash and Lily was like visiting all over again. The wonder of the Strand, the bustle of Times Square, the characters you see along the way. This was the kind of book that I wanted to rush through but was thankful when I was forced to savor it. I would dip in for a few spare minutes every chance I got. The flap explains that Rachel Cohn wrote Lily’s chapters and David Levithan wrote Dash’s chapters without knowledge of what the other was writing. This just adds to the magic for me. I love that it was written this way. It was such a joy to read. 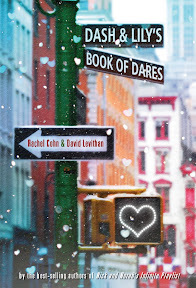 If you need a cute love story or are feeling nostalgic for some Christmas once more, you should definitely pick up Dash and Lily’s Book of Dares. I loved this one too! It was such a sweet story, but realistic too. I’m so glad you enjoyed it! I read it the day after Christmas and it was such a great book to read right around the holidays. Yay! Another fan of this fabulous book. Oh, sorry…still excited about it even months after the first read…hehe. Really, it was fun, relateable, and definitely makes you have an urge to at the very least own a red moleskine notebook. Thanks for sharing…and happy reading! I can’t wait to read this! I’m trying to not buy any new books until after I move, but this is tempting me in a major way.